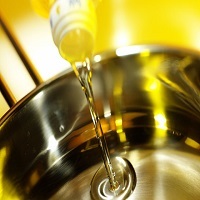 Cooking oil is basically animal, plant or synthetic fat used in baking,frying and other types of cooking. It is also used to prepare food and giving flavour for the food that doesn't involve heat, such as salad dressings and dips for bread, and in this logic it might be more precisely called as edible oil. Edible oil is naturally a liquid at room temperature, while some oils that comprise of saturated fat likepalm oil, palm kernel oil,coconut oil are solid. As said by theConsumer Guidance Society of India, more than 60% of loose edible oil sold is adulterated. If right precautions are taken by the consumer at the time of purchase of such produce then it can make him alert to avoid procurement of such food.